The 2003 World Series was the championship series of Major League Baseball's (MLB) 2003 season. The 99th edition of the World Series, it was a best-of-seven playoff between the National League (NL) champion Florida Marlins and the American League (AL) champion New York Yankees; the Marlins upset the heavily-favored Yankees, four games to two. The series was played from October 18 to 25, 2003. This is the most recent Series in which the losing team outscored the winning team; the Yankees lost, despite outscoring the Marlins 21–17 in the Series. This was the Marlins' second World Series championship win, having won their first in 1997. The 2003 World Series featured the New York Yankees in their sixth Series appearance in eight years. Opposing them were the wild card Florida Marlins, appearing in their second World Series in their eleven-year franchise history. The Marlins became the second straight wild card team to win the World Series; the Anaheim Angels won in 2002. The series was, however, somewhat overshadowed by the League Championship Series that year, when the Chicago Cubs and the Boston Red Sox, both widely believed to be cursed, went down in dramatic defeats only five outs away from the pennant, and each in seven games. However, Marlins manager Jack McKeon disagreed, and having lived in South Amboy, New Jersey and attending Yankee games when a child, said that he wanted to play the Yankees in his first World Series. By losing the series, the Yankees became the first team to lose two World Series to post 1960 expansion teams; losing to the Arizona Diamondbacks, who entered the National League in 1998, in the 2001 World Series and now the Marlins who entered the National League in 1993. It was the 100th anniversary of the World Series, and advertised as such. However, it was only the 99th event due to a strike cancelling the 1994 World Series and the boycott of the 1904 World Series by the National League. The Marlins started the season 16–22 when they fired manager Jeff Torborg and hired McKeon, who had been retired from baseball for over two years. They went 75–49 under McKeon to win the wild card. At 72, McKeon would become the oldest manager to ever win a World Series. They lost the first game of the NLDS to the San Francisco Giants, but came back to win the final three. After going down three games to one to the Cubs in the NLCS, they rallied to win the final three games. In the World Series, the Marlins put up their young roster with a $54 million payroll up against the storied Yankees and their $164 million payroll. By facing the Marlins, the Yankees faced every team in the National League that had won a National League pennant. Since then, the 2005 Houston Astros and the 2007 Colorado Rockies have reached the World Series without facing the Yankees. As of 2017, the Washington Nationals, who were originally the Montreal Expos, are the only National League team to have never made the World Series, joining the Seattle Mariners, who are the only American League team without any pennants. Fox Sports again provided coverage of the World Series on American television. Joe Buck and Tim McCarver broadcast the series for Fox. National radio coverage was provided by ESPN Radio, with Jon Miller and Joe Morgan calling the action. The Marlins' local broadcast aired on WQAM in Miami and on the Marlins Radio Network. Jon Sciambi and Dave Van Horne were in the booth. The Yankees' local broadcast was carried by WCBS-AM and the New York Yankees Radio Network, with John Sterling and Charley Steiner broadcasting. The Yankees had been awarded home-field advantage for this World Series, because the AL won the 2003 All-Star game. MLB had alternated home-field advantage for the World Series between the two leagues prior to this, and the NL would have been due for home-field in 2003 before the change. A trio of Marlins pitchers managed to keep the Yankees in check. Brad Penny, Dontrelle Willis, and Ugueth Urbina held New York to two runs. Juan Pierre scored Florida's first run in the first on Iván Rodríguez's sacrifice fly and drove in the other two with a two-run single in the fifth. The Yankees scored on a single by Derek Jeter in the third and a home run by Bernie Williams in the sixth, the eighteenth postseason home run of his career, tying a mark shared by Reggie Jackson and Mickey Mantle. Urbina ran into immediate trouble in the ninth, walking Jason Giambi to lead off the inning and, one out later, walking pinch-hitter Rubén Sierra to put pinch-runner David Dellucci in scoring position. However, Alfonso Soriano was called out looking on a 3–2 pitch and Nick Johnson flied out to center to end the game. David Wells pitched seven solid innings for New York in a losing effort. The defeat marked the first Yankees loss of a home World Series contest since Game 2 of the 1996 World Series. The Yankees bounced back behind the arm of Andy Pettitte who allowed only six hits and one walk in ​8 2⁄3 innings. He allowed only one unearned run on a single by Derrek Lee in the ninth. The Yankees' Hideki Matsui hit a three-run home run in the first inning on a 3–0 pitch, becoming the first Japanese player to hit a home run in a World Series, and also became the second Japanese player to play a World Series game. Nick Johnson hit a bunt single in the second with one out and scored on Juan Rivera's double with Rivera being tagged out at third. Alfonso Soriano hit a two-run shot off reliever Rick Helling in the fourth. Florida's starter Mark Redman lasted only ​2 1⁄3 innings while allowing four runs. It would be the last World Series game won by the Yankees at the old Yankee Stadium. Game 3 was a close pitcher's duel for the first seven innings. Florida starter Josh Beckett held the Yankees to one run through seven innings, the lone run coming on a bases-loaded walk after two consecutive borderline pitches that were called balls. The Marlins struck early off New York starter Mike Mussina with Miguel Cabrera singling in Juan Pierre in the bottom of the first. Mussina settled down and did not allow another run to the Marlins in seven strong innings. Beckett pitched strong into the eighth until he started to tire. He left with one out in the eighth having recorded ten strikeouts for the night. Reliever Dontrelle Willis entered the 1–1 game and got one out, but gave up an opposite-field single to Hideki Matsui to give the Yankees their first lead of the night. Chad Fox relieved Willis and struck out Rubén Sierra to end the inning. The Yankees offense would return in the ninth. Aaron Boone led off the inning with a home run to left, and after walking Alfonso Soriano and hitting Derek Jeter, Bernie Williams hit a three-run shot to center to give the Yankees a 6–1 lead. Williams' home run was his nineteenth in the postseason, a new Major League record. His 65 RBIs were also the most in postseason history. Yankees closer Mariano Rivera pitched the final two innings for his record 30th career postseason save. Mussina received his fifth postseason win. The game was interrupted in the seventh by a rain delay lasting 39 minutes. It was the first weather-related delay of a World Series game since Game 1 of the 1996 World Series, which also involved the Yankees. The Marlins jumped out to an early lead against Yankees starter Roger Clemens. Miguel Cabrera hit a two-run homer in the first and Derrek Lee hit an RBI single. Clemens settled down and held the Marlins scoreless in the next six innings. When Clemens struck out Luis Castillo to end the seventh, it was then thought to have marked the end of his Major League career. With flashbulbs lighting up the stadium, the crowd gave him a standing ovation; the Marlins even paused to applaud in recognition of Clemens' what then appeared to be a hall-of-fame career (as it turned out, Clemens would put off his retirement to sign with the Houston Astros for 2004). Meanwhile, the Yankees scored their first run on a sacrifice fly by Aaron Boone in the second inning. Marlins starter Carl Pavano held the Yankees to that lone run through eight strong innings. Clemens was set to get the loss until the Yankees rallied in the ninth against Ugueth Urbina. Bernie Williams singled with one out, Hideki Matsui walked and Jorge Posada grounded into a force play. Pinch-hitter Rubén Sierra fouled off two full-count pitches before tripling into the right-field corner to tie the ball game. The game headed to extra innings. The Yankees threatened to score in the top of the eleventh when they loaded the bases with one out off Chad Fox. Braden Looper relieved Fox and struck out Boone, and replacement catcher John Flaherty popped out to third. The Marlins won the game in dramatic fashion in the bottom of the twelfth when Álex González led off with a home run off Jeff Weaver that just cleared the fence in left to help the Marlins win 4–3. Prior to the home run, Gonzalez had been 5-for-53 in the 2003 postseason. Game 5 featured a rematch of Game 1's starters, Florida's Brad Penny versus New York's David Wells. Before a sellout crowd of 65,975, the Yankees did not appear very sharp, botching a rundown play in the fifth inning that led to two Marlin runs. Slumping Alfonso Soriano was benched and first baseman Jason Giambi nursed a leg injury. Wells left the game after pitching just one inning due to back spasms. His replacement, José Contreras, pitched three shaky innings, allowing three walks and four runs. The Yankees drew first blood with a sacrifice fly from Bernie Williams in the first. In the second, the Marlins scored on an RBI double by Álex González and Brad Penny helped his own cause by singling in two more runs. They scored again on a Juan Pierre double in the fourth and a two-run single by Mike Lowell in the fifth, to give the Marlins a 6–1 lead. The Yankees began clawing away at that lead with a Derek Jeter RBI-single in the seventh. Dontrelle Willis relieved Penny by pitching a scoreless eighth. In the ninth, Jason Giambi hit a pinch-hit home run to right field off reliever Braden Looper. That made it 6–3 Marlins. After a Jeter single, Enrique Wilson doubled him home to cut the Marlins' lead to 6–4. Ugueth Urbina relieved Looper and retired Bernie Williams on a fly ball near the outfield wall which was caught by Juan Encarnación just inches away from a home run and Hideki Matsui on a ground ball to first base to preserve the Marlins win. This would be the seventh and final World Series game at what was then Pro Player Stadium; the Marlins would continue to play at the stadium until the end of the 2011 Major League Baseball season. This was the first of two consecutive games in this World Series to mark the final World Series game in its respective park. This game also marked the first time in MLB history that 1st inning runs had been scored in the first 5 games played in a World Series. The series headed back to New York for Game 6, marking the 100th World Series game ever played at Yankee Stadium. Marlins manager Jack McKeon decided to start 23-year-old Josh Beckett on three days' rest. Beckett made the move seem brilliant—his complete game shutout in the final game of the World Series made him the first to accomplish the feat since Jack Morris of the Minnesota Twins in 1991. The Marlins scored the game's only runs on three consecutive two-out singles by Alex Gonzalez, Juan Pierre and Luis Castillo in the fifth and Juan Encarnación's sacrifice fly that scored Jeff Conine, who had reached on an error the next inning. Andy Pettitte pitched seven strong innings in a losing cause with only one run being earned. Mariano Rivera pitched the last two innings for New York. This game was the last World Series game ever played in the Old Yankee Stadium. With the victory, the Marlins became the first National League team since the 1981 Los Angeles Dodgers, the last opposing team to win a Series championship at Yankee Stadium, to win the World Series without having home field advantage. They are just the fourth team overall to do it since the 1984 Detroit Tigers, following the 1992 Toronto Blue Jays and the 1999 New York Yankees. The 2006 St. Louis Cardinals later accomplished the same of feat, as did the 2008 Philadelphia Phillies, the 2014 San Francisco Giants, the 2016 Chicago Cubs and most recently the 2017 Houston Astros. They also became the second expansion team in the National League to win two World Series titles, following the New York Mets who achieved this feat in 1986; the Toronto Blue Jays of the American League, who pulled this off in 1992 and 1993, are the third major-league expansion franchise to do so. The Kansas City Royals, also of the American League, became the 4th expansion franchise to win two World Series titles, adding the 2015 title to their 1985 win. The Marlins also became the fastest expansion team to win two World Series titles, as the Mets won their second title in their 25th season, and the Blue Jays did it in their 17th (the Royals, joining the group 12 years later, got their second title in their 47th season). The championship was the Marlins' second despite never having won a division title. The Atlanta Braves had won the NL East every year since 1995 going into this World Series, a strike ended the 1994 season without division winners, and the Philadelphia Phillies won the Marlins' division in 1993 (that streak would end in 2006, when the New York Mets claimed the NL East title). The Marlins also became the first team since the creation of the Division Series to win the World Series without ever having home-field advantage during their entire post-season. As of 2018[update], the Marlins have a 6-0 record in postseason series play; until the Tampa Bay Rays lost the 2008 World Series, they had extended their home state's perfect streak to 8-0. This was the last World Series game held in the original Yankee Stadium before its closure after the 2008 season. The last World Series in which two stadiums hosted their final World Series games until this year was the 1959 World Series. The Marlins have not played in a World Series since 2003, but the Yankees have, as the new Yankee Stadium opened in 2009, the year of their 27th World Championship. It happened previously in 1918, 1959, 1977, 1992, and 1996. ^ "2003 World Series". Baseball-Reference. Retrieved January 6, 2014. ^ "How Many MLB Wild-Card Teams Have Won the World Series?". The Cheat Sheet. Retrieved August 26, 2017. ^ "2003 World Series Game 1 – Florida Marlins vs. New York Yankees". Retrosheet. Retrieved September 13, 2009. ^ "2003 World Series Game 2 – Florida Marlins vs. New York Yankees". Retrosheet. Retrieved September 13, 2009. ^ "2003 World Series Game 3 – New York Yankees vs. Florida Marlins". Retrosheet. Retrieved September 13, 2009. ^ "2003 World Series Game 4 – New York Yankees vs. Florida Marlins". Retrosheet. Retrieved September 13, 2009. ^ "2003 World Series Game 5 – New York Yankees vs. Florida Marlins". Retrosheet. Retrieved September 13, 2009. ^ "2003 World Series Game 6 – Florida Marlins vs. New York Yankees". Retrosheet. Retrieved September 13, 2009. Wikimedia Commons has media related to 2003 World Series. 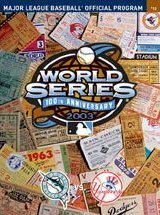 History of the World Series - 2003 at The SportingNews. Archived from the original on 2008.